We recently found these great foam blocks at the Dollar Tree. I may have bought three bags, each with 50 blocks, but who’s counting? I knew I’d easily come up with all kinds of fun activities for these small (approximately 3/4″) blocks. For a simple math activity, I arranging some blocks together and traced their outlines. I had my two oldest (4 years and 5 years old) guess how many blocks each outline would hold. The first time around we definitely had some silly answers…37! However, once they started laying the blocks on the paper to fill in the outline they soon started making more educated guesses. The printable file comes with instructions for making the bag, instructions for using the bag, a busy bag label, and 16 different outline cards. I even threw in a grid that you can print on cardstock and cut apart to use instead of blocks if you can’t find them at a Dollar Tree near you. 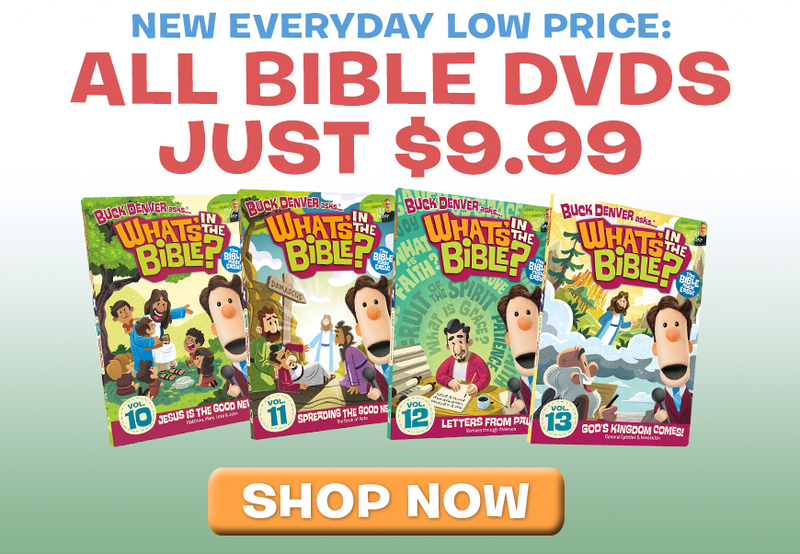 What’s are your favorite dollar store learning tools? This is a great activity! Thanks so much!!! I added lines to make it easier for my two year old. I can see using this to teach perimeter and area to my 5th grade students too! My 2-year-old would love this. She loves puzzles. Thanks for sharing at Mom’s Library. I saw those blocks at the store and passed them up. I will be back for them. Just pinned this. Thanks so much! I recently bought a 3rd bag of these blocks too. We use them for various math activities, but I love having another activity to do with them! I keep thinking I need to go grab a fourth bag 🙂 I’d love to hear about some of the activities you use these for. If you’ve posted about them, feel free to leave a link in your comment. I just use them for basic non-creative things like counting, color sorting, patterning and experimenting with the balance scale. Ha! 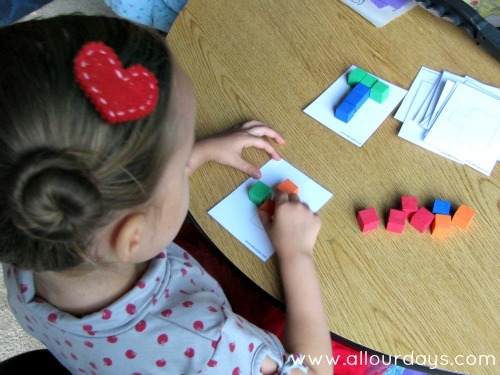 Depending on the child, one might use them for 1:1 correspondence, and one uses them as counters for math games. Oh, we graph blocks too. This post is about a different set of blocks, but these smaller ones would work wonderfully too! ooo, such a great idea! 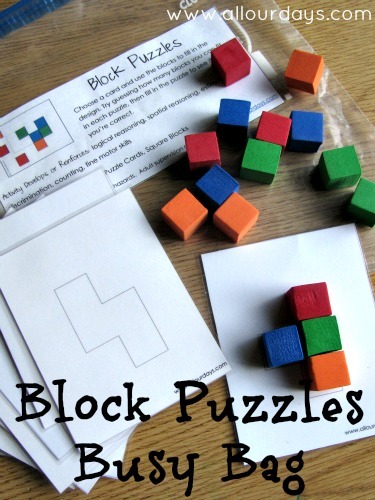 I have seen these blocks a few times and kept thinking about how to use them. Now I need to get them next time! Glad you found my blog. So, happy to be your newest follower! I love finding things at the Dollar store. This is such a great idea, Allyson. Thanks for all of your hard work and for sharing these ideas with us. I’m so glad you’re enjoying our series! We’re enjoying sharing it, too. Thanks for the tip about the square paper punch, I need to dig mine out and give it a try. I love this series! I just pulled out my 3/4″ Creative Memories square punch and it makes pretty much the same size squares needed for this project. My daughter (just turned 4) loves busy bag projects and my niece (almost 3) is getting a ton of these from me for Christmas! Thanks! I love the idea of giving them for Christmas presents. I may give that a go next year (I’m already done shopping for all the neices and nephews, thanks to some great clearance sales a few months ago). Thanks for sharing your ideas. You have put SO much into this series! I’m loving each and every idea. Thank you so much! I just bought a bag of these myself but hadn’t decided what to do with them yet. Love, love, love this idea. Will totally be printing it, thanks so much! I’m also using some of the blocks to make my own number cubes for homemade games and for making a roll and read phonics activity.